Despite all the hate and frustration that users pour over Microsoft’s Internet Explorer, it still holds a large slice of browser market share. And although there are web browsers that provide a better experience compared to IE, many websites (particularly corporate ones), aren’t fully compatible with other browsers. Now, if you’re on Windows platform, you get a lot of alternative options for accessing such websites, even if you don’t want to use Internet Explorer itself. There is a Chrome extension called IE Tab, which enables you to open websites using IE engine (Trident) within a Chrome tab. Another option is to use the Maxthon browser for Windows, which uses both Webkit and Trident rendering engines. The browser lets you seamlessly switch between rendering engines, depending on the type of webpage you want to access. But on Mac, your options for rendering IE supported websites are fairly limited. That’s because IE’s rendering engine, Trident, is Microsoft’s proprietary. And even though the company allows third party developers to use it, their implementations are legally restricted within the Windows ecosystem only. And that means, Maxthon, or any other browser for that matter, cannot use the Trident engine on OS X, and the IE Tab extension also does not work on Mac for the same reason. Even apps like CrossOver or Wine, which allows you to run some Windows applications on Mac, do not officially support Internet Explorer. Note: Microsoft used to maintain a version of Internet Explorer for Mac. The software has long since been discontinued. The last version of Internet Explorer for Mac, was released on June 16, 2003, based on the Tasman rendering engine. 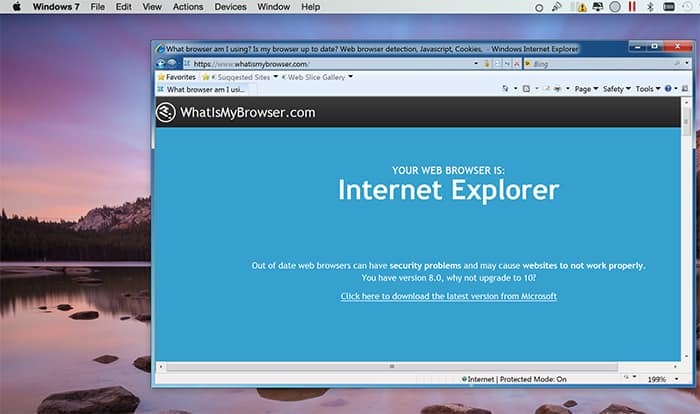 There are still a few alternative ways to run Internet Explorer on Mac. But one thing is certain — in order to use Internet Explorer, you need access to a Windows system. You could access the Windows environment either locally on your Mac (by virtualization or dual-booting), or remotely (using Cloud Browsing solutions). Note: If a particular website serves a different version for Internet Explorer, you can access the IE version of the site on Safari simply by changing its user agent. This trick might even be useful for getting around some of the IE-restricted sites. But if a website implements a technology that is only supported on Internet Explorer, changing the user agent might not be worthwhile. If your Mac has enough free resources, you may consider running a Windows OS on Mac via virtualization. Parallels Desktop is a great virtualization software for running Windows programs on OS X. If you have enough free space available on your Mac, but running low on other resources, such as memory (RAM) or processing power, virtualization might not be an optimal solution. Instead, in such a case, you can dual-boot Windows with OS X using Apple’s Boot Camp software. That way, both the operating systems will be able to utilize the Mac hardware to their full potential. If you want to run Internet Explorer on Mac without installing Windows on it, some cloud browsing solutions allow you to access websites in IE from within any web browser. These solutions basically provide access to Internet Explorer, running on their Windows based servers, through a proxy. As you may guess, keeping such a service online involves significant maintenance costs. And so, these services are usually not accessible for free. Even if a free alternative is available, there will be some restrictions imposed on its usage, or the user experience would not be recommendable. 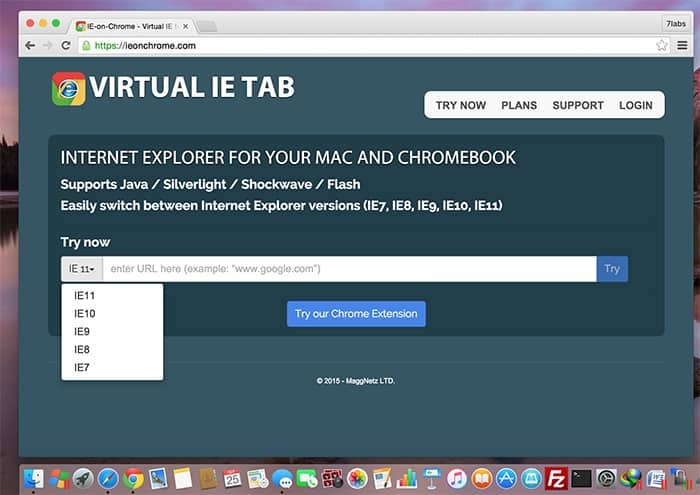 Virtual IE Tab (IE-On-Chrome) is a subscription based service that allows you to access IE-supported websites within Chrome on Mac or Chromebooks. The service supports Java, Silverlight, Shockwave and Flash, and lets you choose between multiple versions (IE7, IE8, IE9, IE10 and IE11) of Internet Explorer. So you can expect it to work with most (if not all) of the IE-only websites. IE-On-Chrome is available as a Chrome Extension on the Chrome Web Store, but it may also be used as a regular web proxy on any web browser by navigating to the proper URL. The service supports three different subscription plans. The Starter plan, which is free, is convenient for users who need Internet Explorer only once in a while. The Basic plan costs $4.99 per month, and is convenient for occasional users of IE. The Professional plan costs $9.99 a month, and is ideal for frequent IE users. If you know of any other alternatives to use Internet Explorer on Mac, let us know in the comments below.